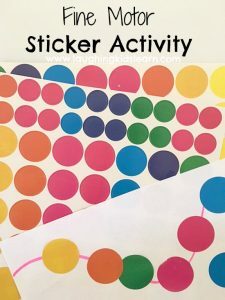 If you’re looking for an activity or piece of art that is fun to create with your toddler or preschooler then give this a go. 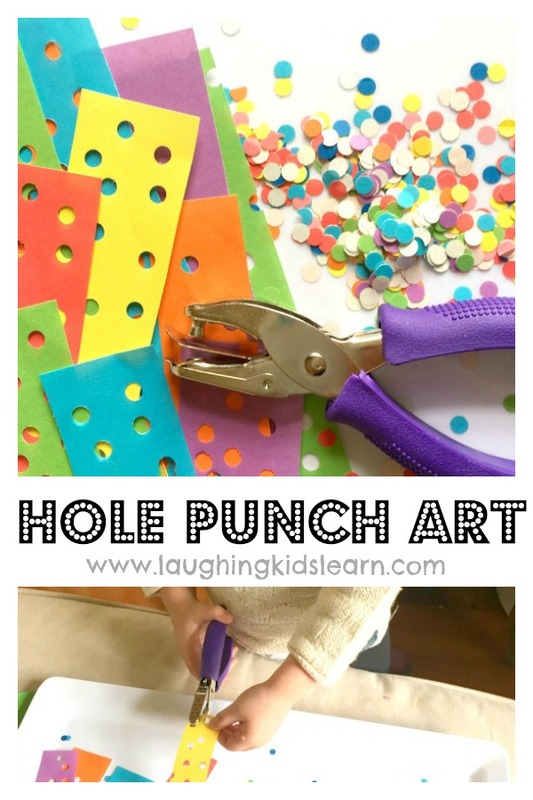 It’s contact paper hole punch art for kids! It was a huge hit at our house. 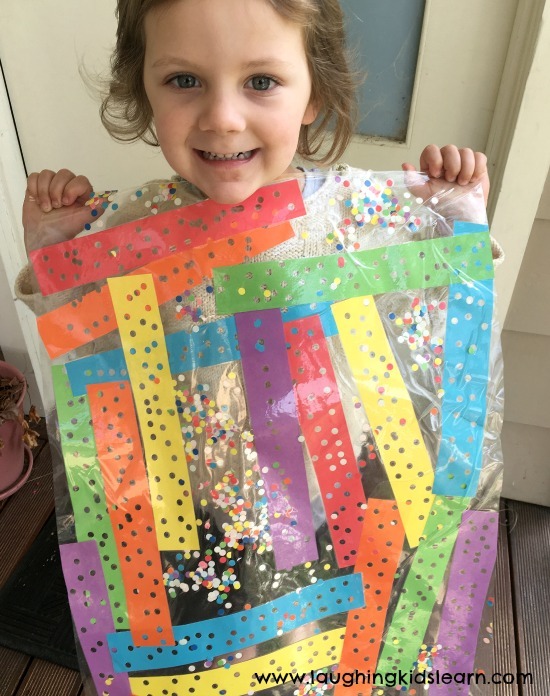 Inspired by a post created by my talented friend Debs from over at Learn with Play at Home, we did our own version of an art piece and the process and end result was nothing short of wonderful. 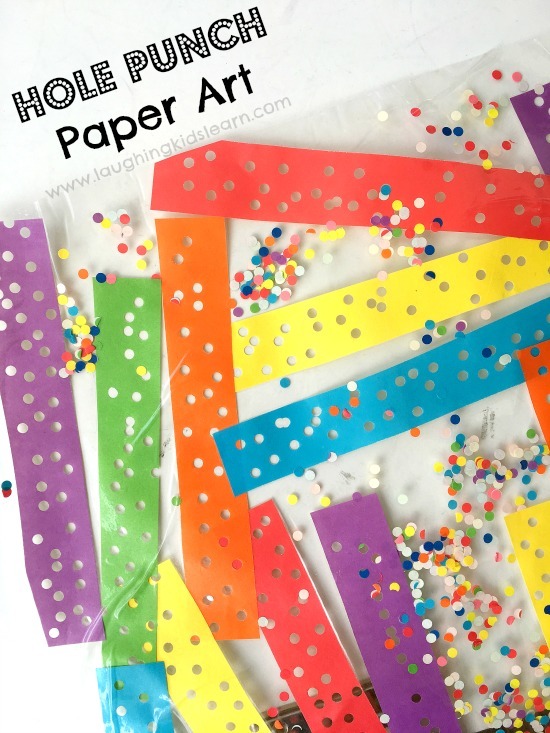 The set up was really very quick, but you might want to have a tray to catch all the paper ‘confetti’ holes. Hot tip! 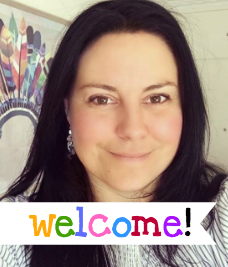 To begin, I simply cut out long strips of coloured paper. This made it a lot easier for her to manage and coordinate the paper and hole punch at the same time. 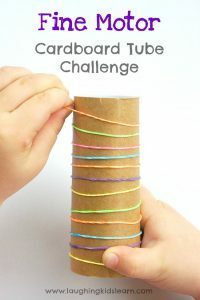 We did attempt to punch through more than one piece of paper at one time, however, Boo didn’t have the strength in her hand to be able to do this, so I would only recommend doing one piece at a time. 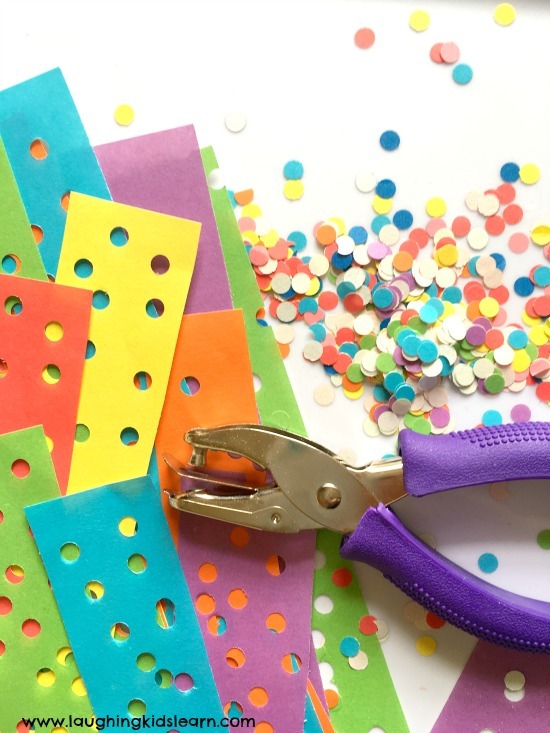 If your child is having trouble with coordinating the hole punch and paper, you might like to assist them by holding each end of the paper for them. Then they can just focus on squeezing the hole punch, possibly with two hands. 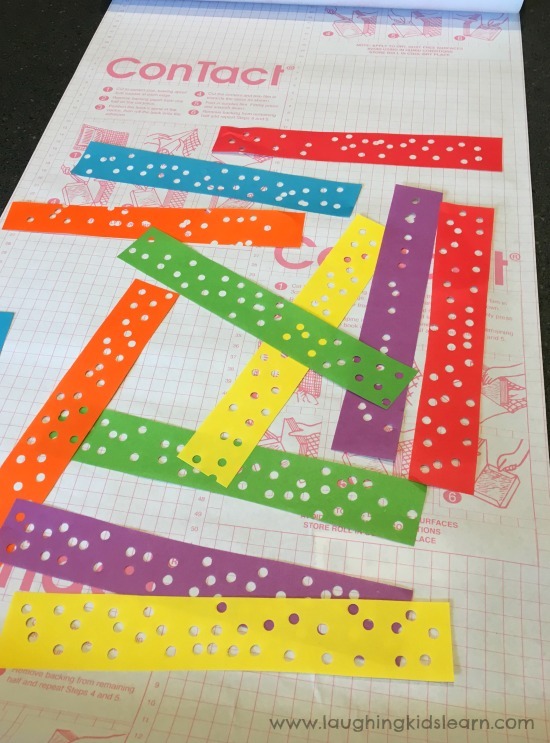 For this contact paper hole punch art for kids, I rolled out a long length of contact paper and had Boo arrange the strips of paper that had hole punches through them. 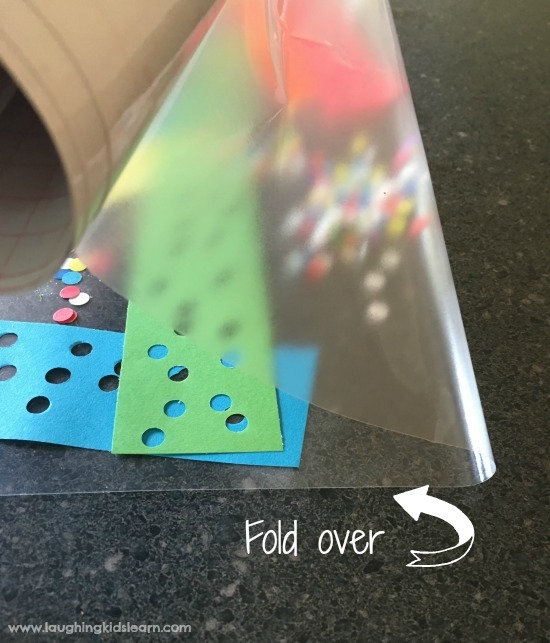 I peeled away the backing for that section only and had her, once again, arrange the strips of paper onto the sticky contact paper. 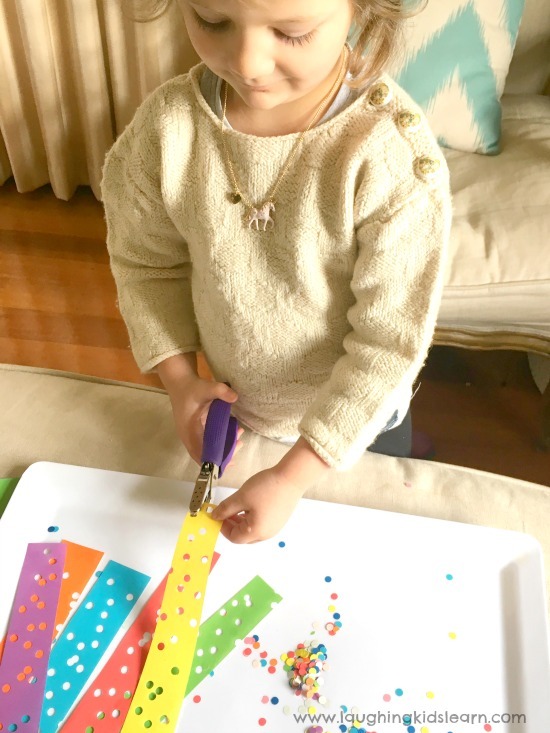 Boo also sprinkled the confetti holes over the art work for extra gorgeousness. To keep it simple, I folded a length of sticky contact paper over the finish art work to seal it. This is ideal as it stops any of the confetti holes from dropping off when it’s on display. As you can see, the final piece of art looks fantastic and Boo was so proud of herself. She has this piece hanging on her window at this very moment, which looks amazing when the sun is streaming through it and all the holes. 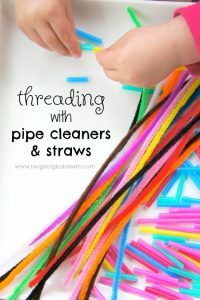 Is this something that your child would enjoy doing? Amazing idea! kids really need a art space to build mental growth and developed kids creativity. Its really inspired to learn with fun. Thanks for sharing such a nice blog.